Mario Champion doesn’t want to be impolite about it. 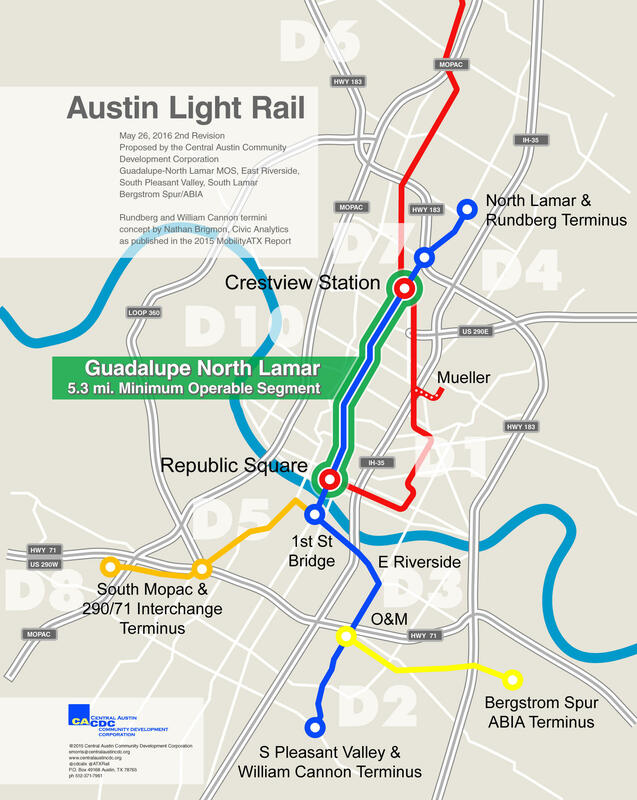 A proposal for a light rail route in Austin. "I feel like the $720 million is a good step, but it's not nearly a step far enough." Champion is on the city’s Urban Transportation Commission, and what he’s talking about here is light rail. You might be thinking, 'Didn’t we just put light rail to a vote?' And yes — a light rail proposal failed in 2014. Fifty-seven percent of voters rejected it. But this time, a group of pro-transit folks say they’ve found the sweet spot. While the 2014 rail proposal went along Trinity through downtown, straight through the middle of the UT campus, the proposal Crossley’s talking about would go up Guadalupe starting at 4th Street, and then on North Lamar to Airport, just south of 183. But while advocates say this is the “right route,” the Mayor won’t bite. "We can't make more room for more cars. So we have to figure out some other way to move people around." And he said he can’t imagine a future Austin without it, but now just isn’t the right time. His current bond proposal puts almost $500 million toward road projects along major streets like Guadalupe and South Lamar, for which the city has spent a lot of money creating future plans. The Mayor said that after all the work that's gone into planning, now’s the time to act. And while the pro-rail activists, like Mario Champion, support the Mayor’s plan, they take some issues with it as well. He says the mayor's proposal would put a lot of money towards bike and sidewalk improvements, but that it focuses too heavily on road improvements. Council members and the mayor will hear public comment on the current bond proposal Thursday. Should voters approve the measure in November, the average homeowner would pay roughly five dollars more in property taxes a month.